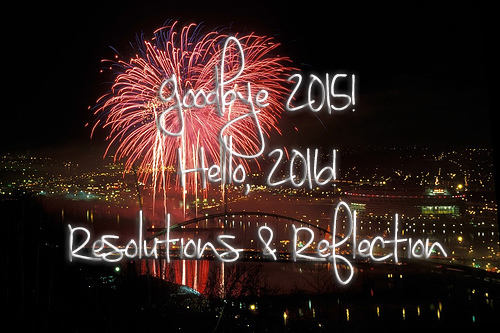 Goodbye 2015, Hello 2016: Resolutions, Reflection & Makeup Ideas! I've been planning and planning for 2016 for the past month. I've got so many ideas of things that I want to do and the hardest part is putting the work in to do them. Today I'm going to share some of 2015 with you as well as some plans or "resolutions" for 2016. Oh, and I'll post a couple of last minute makeup looks as well, in case you need some inspiration. I had to move, again. Spent months trying to lose weight with zero progress. Ended the year with the flu! Ah yes, 2015 has been slightly nightmarish and I am glad it's coming to an end in only a few hours. I'm not one of those "New Year, New Me!" people. because that's unrealistic and that "NEW YOU!!!!" is only going to last a month at best before you go back to your old habits. However, I do believe in leaving the past year in the past and starting over, without unrealistic expectations. I don't expect this to be the best year ever, but I expect to survive it. I expect to take what I've learned from the past year to avoid making the same mistakes in 2016. Here are a few "resolutions". Start over with the weight loss/fitness. Kick the caffeine addiction, again. Find a relevant part time job & blog full time. Overcome my anxiety, to a point that I can function normally. Regain the self confidence I've lost. Stress less & have more fun. I don't find that my "resolutions" are all that unreachable. I plan to make small changes rather than attack everything at once. I'm planning to make a few changes with my content. Yes, I'll still be regularly blogging about makeup, probably 2-3 times per week. I'll also be blogging about my weight loss and fitness progress and there will be a new random topic I discuss every Thursday. On most Sundays I'll be writing about what I'm currently reading or watching on Netflix, favorite blogs/bloggers and youtubers. This is going to stretch me to posting 6x per week and I plan to maintain it. I'm also going to begin offering guest posting and advertising on my blog. I really have a lot of plans. Having the flu this past week has really slowed me down. Here's a couple of looks I posted for NYE inspiration! Stayed tuned; tomorrow I'm going to post my favorite products from 2015!